England has been basking in a 30° heatwave this week, and the British summer has shown no signs of slowing down. While you might enjoy the sunshine from the comfort of your air-conditioned office, it’s a different story at home. Unless you have the luxury of a fitted AC system in your house, you’ll have been feeling the effects of the heatwave – especially at night. It’s too hot to lounge at home, it’s too hot to sleep and it’s definitely too hot for a cup of tea. So what are your options? First of all, don’t fret! We’ve made a list of the top things you can do to keep your home cool in the heat. Our first instinct on a lovely summer’s day is to open the curtains and let the sunshine in. However, you’re essentially transforming your home into a greenhouse by doing so. Keep your curtains or blinds closed throughout the day. If you want something a little more heavy duty, consider getting some black out blinds to help keep the heat out. 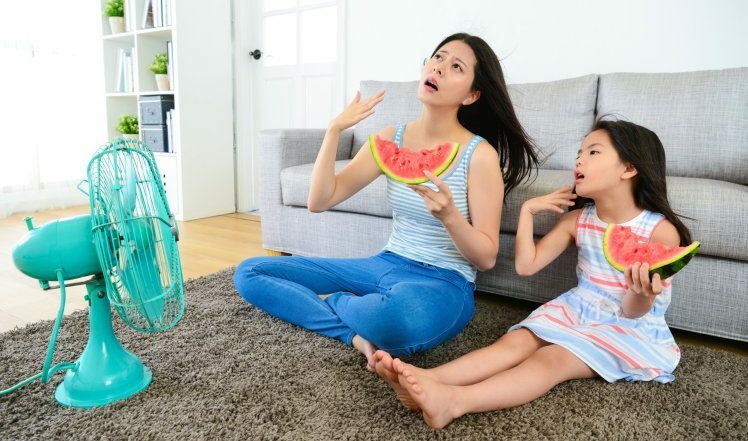 An electric fan might seem like the obvious go to when temperatures start to rise – but there’s a helpful trick you can use to make it even cooler. 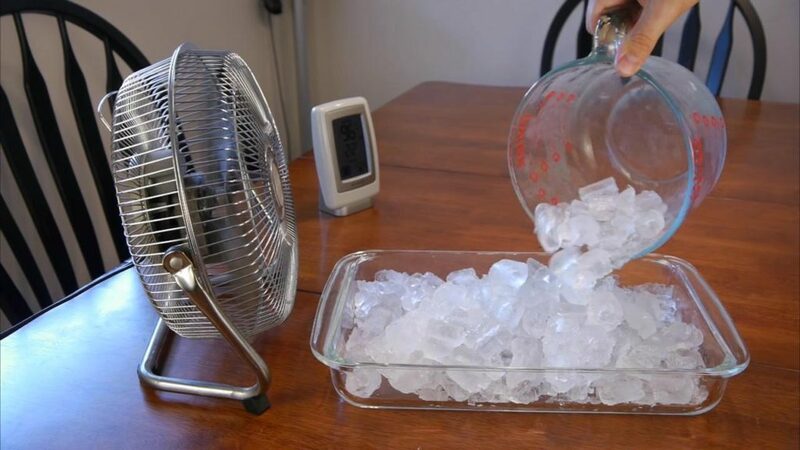 Place a bowl of icy water in front of the fan. As the ice evaporates, it will make the air feel pleasantly cool. Hot water bottles are perfect for those frosty winter nights, but they’re a real lifesaver in summer too. Fill your water bottle with cold water and then stick it in the freezer. You’ll have your homemade ice pack ready for when you need it most. Speaking of freezers, hot water bottles aren’t the only thing that you can put in there to help you keep cool. Try placing your sheets in the freezer for a couple of minutes before you’re about to go to bed. Make sure you place your sheets in a plastic bag before you pop them in the freezer – you don’t want your bed to smell like a frozen pizza. It’s only a quick fix but it will help give you a breather from the heat. Whilst the weather is hot, you might want to keep away from silk or satin sheets. Trade these fabrics for light coloured cotton sheets which will be a little cooler to sleep in. The Egyptians had it right, in fact, they even had their own method of keeping cool. In ancient Egypt, they would dampen a sheet in cool water and would use it as a blanket. If you want to do it like the Egyptians and try this at home we recommend placing a dry towel under the damp sheet. No one likes wet bedding! Wet sheets aren’t fun when you have to sleep on them, but they can be quite useful for keeping the house cool in other ways. Hanging a wet sheet in front of the window will actually help to bring the rooms temperate down. Try and avoid dishing up hot meals whilst the weather is so hot. We all enjoy a Sunday roast but summer isn’t the time for slaving over a hot stove. Trade in the slow cooker for a nice salad that you can enjoy over al-fresco dining. We imagine a hot shower is the last thing on your agenda. However, if you’re showering later on in the evening whilst it’s a little cooler make sure the water is tepid rather than hot. Steam causes humidity, so try cut down on the use of the washing machine and dishwasher too. Light bulbs – even if they are environmentally friendly – give off heat. Save yourself a bit of money on the energy bills whilst keeping the house cool by turning the lights off. The sun shines up until the early evening anyway, so there’s no real need for light bulbs until it gets really late. Like light bulbs, your electrical appliances radiate heat which won’t help when you’re trying to sleep in this weather. Unplug your phone and devices and don’t be tempted to charge them overnight unless you absolutely have to. We know it might seem a little bit dramatic, but if you’re really struggling to sleep, downstairs might be the best place for you. Hot air rises, so sleeping in a room on the ground floor means you’ll feel cooler. If you don’t want to shift your bed downstairs or you live in a flat, you can always move your bedding to the floor.